While I was still motivated to work on my Disney album, I saw this fun inspirational board from Show Us Your Stuff. The color combo in the upper left corner just "screamed" Monsters! This was a lot of fun and took a while. Everytime I looked in the drawer, I found something else to use. I made my own deco squares with pics printed off the internet. I added a little tag I made myself with some fun papers, fibers and I even used my fastenator! My favorite part is the fuzzy fibers I found! They added just the right touch. Love that you were inspired by the colour combo!! 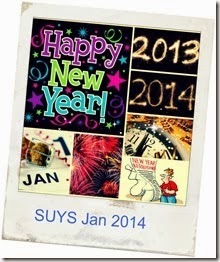 Such a fun page :) Thanks for joining in at SUYS!